The 10 Best Breweries in Wisconsin! Wisconsin is home to some great bars and watering holes. So, you might have guessed that there are tons of breweries within state lines as well. From big names that you’ll see nationwide to small microbrews that you can’t get anywhere else than the great state of Wisconsin—here are out favorite sips across the state. Pabst Brewing Company was established in Milwaukee in 1844. While headquarters and other brewery locations have opened up elsewhere the historic brewery is still open for tours in Milwaukee. Find out where the magic started and enjoy a refreshing Pabst Blue Ribbon for old time’s sake. Six generations of the Leinenkugel’s family has been brewing beers in Chippewa Falls, Wisconsin. Start with a brewery tour at the Leinie Lodge and to check out historic photos and state of the art equipment. Stay a while longer to enjoy any of their award-winning brews. If you’re a real diehard make sure to stock up on your favorite seasonal sips. New Glarus Brewing Company is a Wisconsinite favorite because it is only sold in Wisconsin. You can’t find their beloved Spotted Cow anywhere else in the United States. They use 100 percent natural ingredients to bring you the best handcrafted beers. Make the day memorable by joining in on one of their hard hat tours. For over 160 years the Stevens Point Brewery has been serving the Stevens Point and surrounding areas. Visit their brewery located on Water Street for tours and free samples. Then hit their gift shop where you can purchase beer, soda, and other Stevens Point Brewing Company souvenirs. This is a tour unlike any other you’ve been on! Located just outside of Madison, Capital Brewery is a great place to hang out for the evening. While they have tours and a souvenir shop they have tons of events. From bike events to concerts the Capital Brewery Bier Garden is the place to be from April to October. Lakefront Brewery is located in the Riverwest district in Milwaukee. Every month offers a new Featured beer of the month to try, they even have gluten free and organic options. Tours are constantly going on throughout the day—find out where the all the fun starts and ends at Lakefront. Enjoy a pint of beer at the Tyranena tasting room in Lake Mills, Wisconsin. They have live music every Saturday night along with tons of games to play—bring a group of friends or make some over a couple of beers. In the summer months. head outside and enjoy their Beer Garden. While there’s no grub for purchase they often team up with tasty food carts from around the Dane County to bring you the most local experience possible! Grab a flight of beers right in downtown Minocqua at the Minocqua Brewing Company. 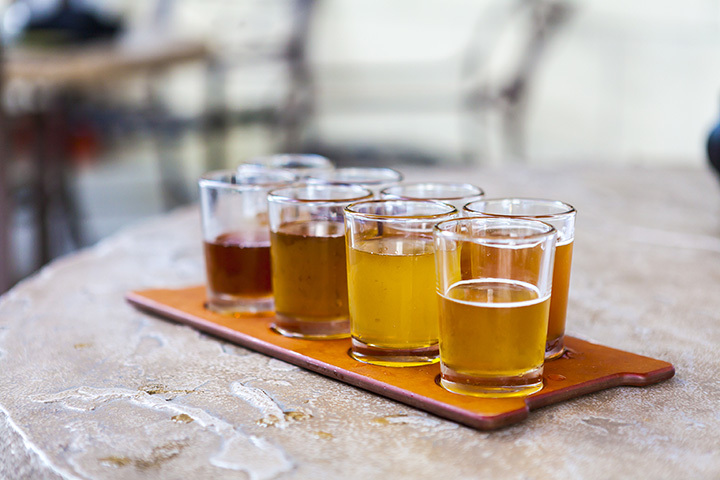 Their flight of seven beers comes a cool Northwoods-themed mini wooden paddle to help give you the full experience. Sip on the outdoor deck or hunker down indoors at the bar area. From seasonal brews to classic light beers, they have it all. Grumpy Troll took home the Silver Award for the World Beer Cup last year. They’ve coined the fact that they brew the most unique beers under the sun. They have 12 beers on tap and a brew master who’s been in the business for over 20 years. Check out what makes the Grumpy Troll so different in Mount Horeb, Wisconsin. Miller Brewing Company has been a leader in the beer industry since its start in 1855. Take a tour of the brewery and finish with ice cold beer samples. Enjoy the Bavarian-Style Miller Inn or their seasonal outdoor beer garden at a Wisconsin landmark. View more Wisconsin Breweries and Brew Pubs.